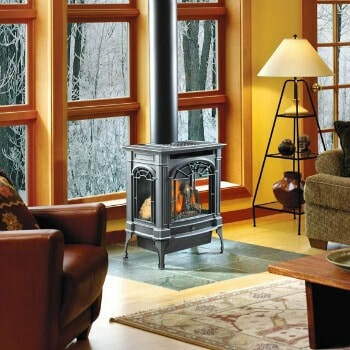 The Lopi | Northfield | Cast Iron Gas Stoves are a true masterpiece. This Lopi gas stove, has a 3 sided fire display making it an elegant home feature. The classic Early American design is a perfect compliment to any home. Classic design paired with a distinct three sided fire display make Lopi Stoves an elegant home feature. Despite its size, the Northfield features an incredibly large 416 square inches of fire viewing, which highlights the stove’s beautiful fire display from any angle in the room. The stove glass features the ANSI approved safety screen. This invisible screen helps avoid accidental contact with hot surfaces. A mighty little stove; the Northfield produces up to 22,000 BTUs and has a turndown ratio of 70%. This turndown ratio gives you total control over your heat output. With rear or top venting options, and close clearances to adjacent walls this stove can be installed nearly anywhere. The Northfield has many great features. One of these features, include the prize winning Ember-Fyre™ burner which delivers an incredibly authentic looking wood fire. Consider adding the GreenSmart™ 2 Wall Mounted Remote to your purchase, so that you may control all of the stove functions from the comfort of your couch. ﻿If the project is outside of Southwestern Montana please visit the Lopi site for dealers that may be near your area for a price. Bare's Stove and Spa may only sell these products bought and picked up from our store locations. Please understand we are unable to ship, sell, deliver, install, service or provide warranty for items outside of our area.